Published: Jan 18, 2016. 09:22 +0100. A massive Google Update hit on the 16th January and lasted all weekend. 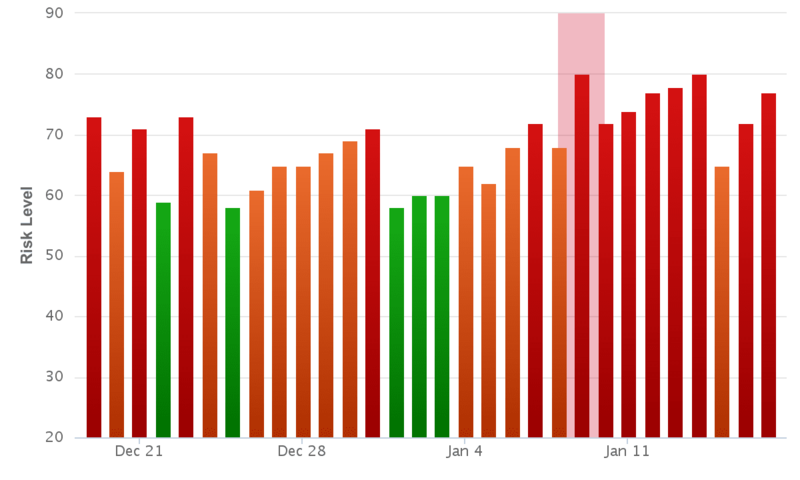 The fluctuations in the SERPs were off the charts, as you will see in a moment. We saw massive movements, both up and down, and with Google previously indicating it was a Core Algorithm Update (and not Penguin or Panda) webmasters are awash with speculation and complaints. Fortunately, this morning, many of the changes seem to have been rolled back which implies that it was testing of some kind. That does not mean we will not see similar or different changes in the near future, as they interpret the data from the tests. We suspect we will see more volatility over the weeks ahead. If you, like us, were constantly checking rankings over the weekend in an attempt to ascertain patterns or other indications to understand the update you will already know that was a waste of time. Until the dust settles, and Google ceases this period of testing you should not worry about the volatility too much. If you have itchy fingers and want to do something, then we recommend reviewing your website for quality issues. The overriding theme always stated by Google is to adhere to the Google Webmaster Guidelines, and focus on producing great content. Check for technical issues, grammar (see Grammarly if you struggle with this), completeness and simply whether that piece of content is any good. The overriding theme we follow is the idea of “10x quality” (see here, here and here). Sure, not every piece will be 10x quality, but if you have that in mind and especially the question”Is this piece of content better than anything else out there?” then you won’t go far wrong. We hope this advice gives you actionable items to consider and distracts you from all the volatility right now. Despite a relatively calm day on the 15th January, the fluctuations were back with a vengeance on the 16th and 17th January. Rank Ranger Risk Index 16th January. © Rank Ranger. MozCast seems to show that the previous volatility of last week never stopped, and just continued into Saturday (the chart is not updated for the 17th yet). MozCast Weather 16th January. © Moz. This shows data up until today (18th January). It shows a similar pattern from what we have seen from the keywords we track ourselves. It shows a significant spike on the 16th and 17th January, and then more calm today as many of those changes appear to have been rolled back. Algoroo SERP Volatility 16th January. © Algaroo. I run SEMrush projects on about 40 different keyword baskets. The last time I’ve seen this much rankings flux was when the Florida algo hit and half of the affiliate population of the Planet woke up to toasted websites. I actually think that the SERPs are dancing like the good old days. I went to SEOchat, first time in a long time, which for a while had the Google Dance Tool, and which would have over a thousand people online as those old-tyme dances were happening. They are sleeping at the switch. About half of my SERPs are up and about half are down, so I think I’ll be OK.
I’m amazed my phones not ringing off the hook … Some of my clients are gonna be pissed if they notice this before their rankings stabilize. I see my website is Good after the Last Google Update. My rankings went up. I must be doing something right, lol. Yes, lots of sites reporting traffic changes that then flip back to normal. And Glenn Gabe reporting a website even reverting back from the algo update last weekend. Yesterday, starting around 10 a.m. ET, one by one, the position of these sites for location based keywords was massively shuffled. It wasn’t a complete giant blow of Panda causing everything and everyone of the keywords to disappear into the oblivion of Page 4 and beyond, but selective keyword and location combos were pushed back. Many other similar combos continued to rank and even improved their positions. Many other similar combos continued to rank and even improved their positions. And then, one by one over the next many hours, these search terms would return to their normal positions. As if a cursor were testing each of these results coming from the previously Panda impacted domains, validating them and then releasing them to their typical page 1 abodes. This was a gradual process, but most certainly the push back to Page 3 or 4 oozed Panda in some of its disguised, real-time form. As of this morning, everything appears to be settled in. The SERPs are back with minor one or 2 place shuffles on Page 1. @mvandemar Sometimes tempting, the SEO discussions are interesting ... but no. Of course, we will know more over the next day or two. We are not even going to try to understand this update. Although we have done this before, this coming week will see us review all our content, especially the few pages that seemed to drop during the recent weekend volatility. Of course, it will be remiss to say we are not keeping a close eye on things (we do report on the changes after all). But, if Google truly is testing many things, it will be virtually impossible to make sense of at this early stage.